New Delhi, March 10 (IANS) With fugitive scamster Mehul Choksi incorporating a company in London after calling himself a Belgian citizen, the Congress on Sunday accused the Modi government of trying to shield him by not seeking his extradition from either the UAE or Belgium with which India has treaties. 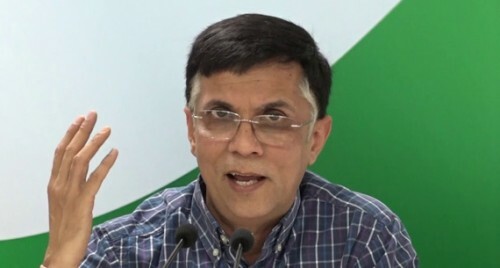 Addressing the media, Congress spokesperson Pawan Khera showed documents revealing that Choksi on March 7 applied for incorporating his company "Reh Venture LLP" in London wherein he has claimed to be a Belgium citizen and given his principal address to be "Miloni Gems, Jumeirah, Dubai, United Arab Emirates (UAE)". Pointing out that India has extradition treaties with both Belgium and the UAE, Khera demanded to know why were the Indian investigating agencies trying to get Choksi from Antigua, a country with which India has no extradition treaty. "Choksi clearly states that he is a citizen of Belgium, with which India has an extradition treaty. He gives his principal address as Dubai in UAE, a country with which we have an extradition treaty. So why are the Indian agencies trying to look for him in Antigua where he neither lives nor has citizenship?" asked Khera. The Congress spokesman asked if the Indian agencies intentionally did not act to save Choksi, a prime accused in the multi-million rupee Punjab National Bank (PNB) scam. "Choksi, against whom the Modi government claims to have issued a Red Corner Notice, just three days back, opens a shell company and the Indian agencies have no clue about it. "The question is whether the UK provided the information and the agencies intentionally did not act or the UK authorities did not inform the Indian authorities despite a Red Corner Notice." Accusing Prime Minister Modi and his government of assisting "fraudsters" like Choksi and Nirav Modi to "loot and scoot", Khera accused the Enforcement Directorate (ED) of failing to nab the absconders. "Are the ED and CBI (Central Bureau of Investigation) blissfully unaware of this? If not why haven't they requested Belgium for an extradition? This points to a major intelligence failure by the Modi government if they aren't even aware of his nationality."